BJP organises a donation drive for landslide and flash flood victims of capital complex. 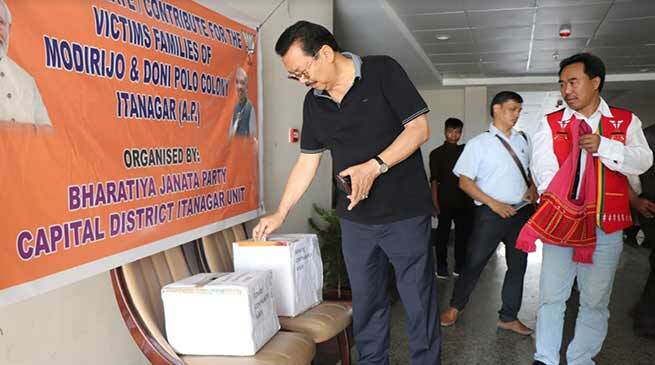 The City Unit of Bharatya Janata Party (BJP) today appeal to the masse people of capital complex to donate in cash and kind for the victims of landslide and flash flood hits Modirijo and Donyi Polo Vidya Bhawan Colony on Friday last. Participating in the donation drive Deputy Chief Minister Chowna Mein said that it is an hour of grief wherein we have lost precious life and lots of property and many people have been affected from the nature fury. We need to be cautious and should prepare ourselves for such disaster and need to take preventive measures before it attack us. Government of Arunachal Pradesh will extend all possible help and support to the victim. City BJP President Tarh Soping while talking to Arunachal24 that donation for the victims would be a social cause and termed it as work for the humanity. He said that the BJP Capital unit is with the people of Modirijo and Donyi Polo Vidya Bhawan Colony at this time of hardship. He appeal to the people to come forward and help and support the victims who are in dire need and support from all of us.